British motorists will be able to fly the flag with pride in the new year thanks to government plans to display the Union Flag on driving licences, transport minister Claire Perry announced today (30 December 2014). Anyone applying for a new licence or changing their personal details will be issued with a licence showing both the British and European Union flags. The changes will apply to motorists in England, Scotland and Wales and provide road users with a symbolic sign of their national identity. People in this country rightly take pride in our national flag which is why I am delighted it will now be displayed on British driving licences. Celebrating Britain strengthens our sense of national identity and our unity. I will feel proud to carry my new licence and I hope others will too. The inclusion of union flags on licences is one of a number of improvements being made for motorists. On 25 October this year, the DVLA announced a dramatic drop in licence fees for those who apply online. In the interests of reducing unnecessary red tape, since 1 October this year the paper tax disc is no more and motorists can pay their vehicle tax by direct debit. From 8 June next year the paper counterpart of the photocard licence will no longer be required. DVLA has also introduced a service to allow the public to check the most up to date information on their driving record. 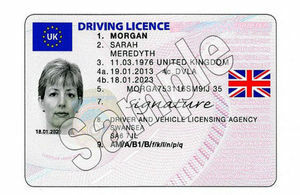 The European Union flag has been displayed on full driving licences since photocards first came into use in July 1998. More than 127 million photocard licences have been issued since they were introduced.